Sunset on Hua Hin’s main beach. 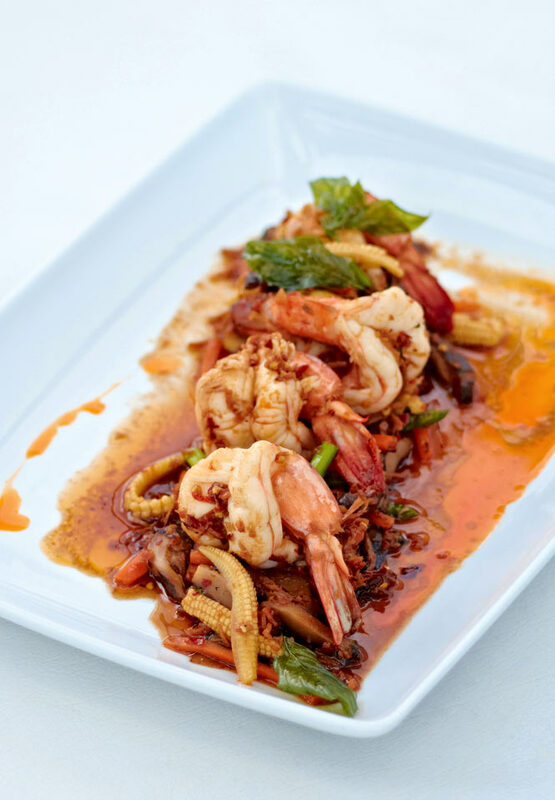 Tiger prawns in XO sauce at Putahracsa’s Oceanside restaurant. 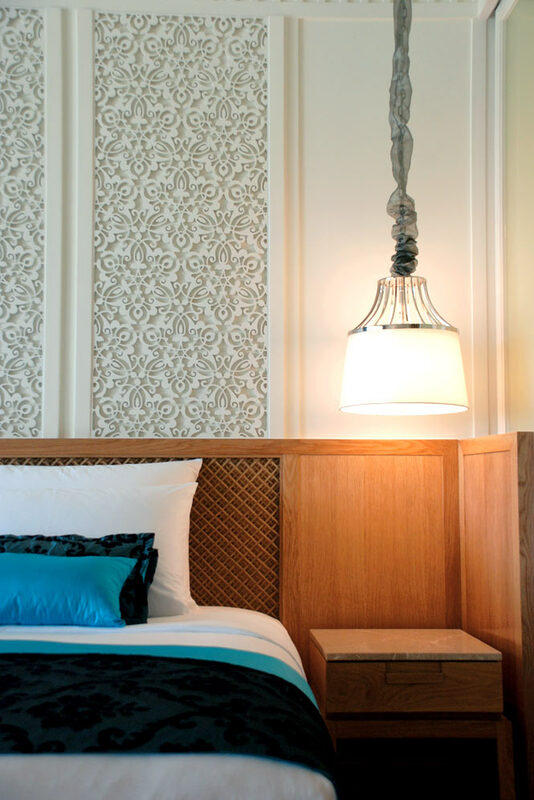 A guest room at InterContinental Hua Hin, the newest resort in town. Spa cuisine à la Chiva Som. Wharfside Chaolay is a popular seafood restaurant. Above: Water views from the Let’s Sea Beach Restaurant. This royal getaway boasts the beaches, spas, and restaurants of other Thai resorts, but moves at a much gentler pace. 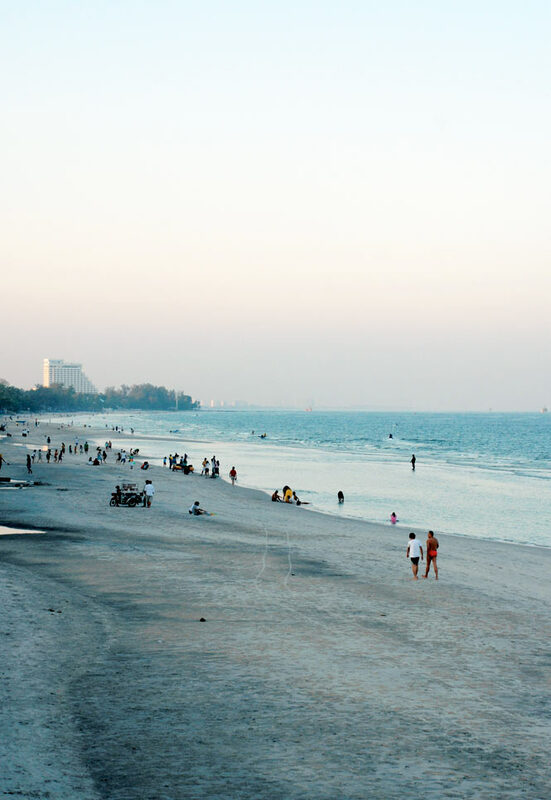 If you’re looking for the bright lights and brash bars that characterize many Thai beach destinations, then you’ll probably be disappointed with Hua Hin. Not that this seaside town is short of allures; apart from its white-sand beach, there are golf courses, smart resorts and spas, and a growing cache of enticing eateries and shops. But Hua Hin, situated about 200 kilometers south of Bangkok on the Gulf of Thailand, lacks the showiness of Phuket and Pattaya thanks, in part, to a century-long dalliance with Thai royalty. King Rama VII built his summer palace, Klai Kangwon (“Far from Worry”), on the northern edge of town in the 1920s, and the current monarch still spends much of his time at the retreat—his military entourage ensuring that the area remains blissfully tout and trouble free. The newest resort on the beach strip is the InterContinental Hua Hin (33/33 Phetchakasem Rd. ; 66-32/616-999; ichotelsgroup.com; doubles from US$242), which threw open its doors in December. 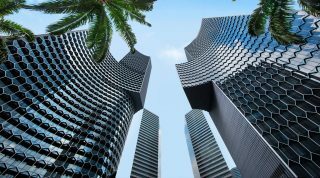 The 119 rooms are light and airy, set in a horseshoe-shaped building enveloping manicured gardens, a pool, and semi-open Thai and Italian restaurants. Next door is V Villas Hua Hin (63–39 Petchkasem Rd. 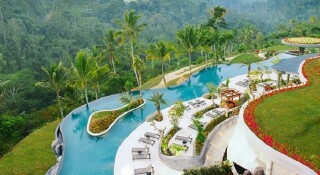 ; 66-32/616-039; accorhotels.com; villas from US$325), where 13 enormous villas are easily the most lavish in town. Modern living and sleeping quarters are separated by long, private plunge pools, while in-room niceties include a well-stocked wine fridge, Jacuzzi bath, and multiple TVs. Chiva-Som (73/4 Petchkasem Rd. ; 66-32/536-536; chivasom.com; from US$1,380 per person for three nights) offers a long list of wellness packages that can last from a couple of days to a couple of weeks. Facilities at this renowned destination spa are only open to resort guests; once you check in you’re pampered with healthy spa food, as well as fitness programs and lectures spanning watsu to kinesis. 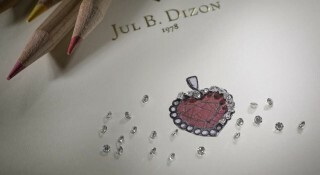 Nutritionists and acupuncturists are on hand for consultations, or you can simply bliss out on beauty rituals. In the heart of town, Putahracsa (22/65 Naeb Kaehat Rd. 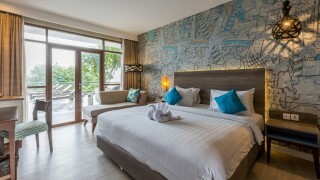 ; 66-32/531-470; putahracsa.com; doubles from US$151) has 59 rooms and villas split over two wings; the newest wing opened on the beach in 2008. The design is neat and minimal, with wood and stone furnishings and fabrics in a palette of caramel, beige, and cream. Away from the water, the two AKA resorts nestle amid forest, lakes, and waterfalls on a hill overlooking town. The accommodations at the all-villa AKA Hua Hin (Moo 7, Baan Nhong Hiang; 66-32/ 618-900; akaresorts.com; doubles from US$500) come with private infinity-edge pools and rooftop gardens. Just up the road, the newer AKA Guti Hua Hin stands out for its streamlined Zen design. A serene open-air spa and 10-meter-long private pools overlooking the valley are among the reasons to check in here. 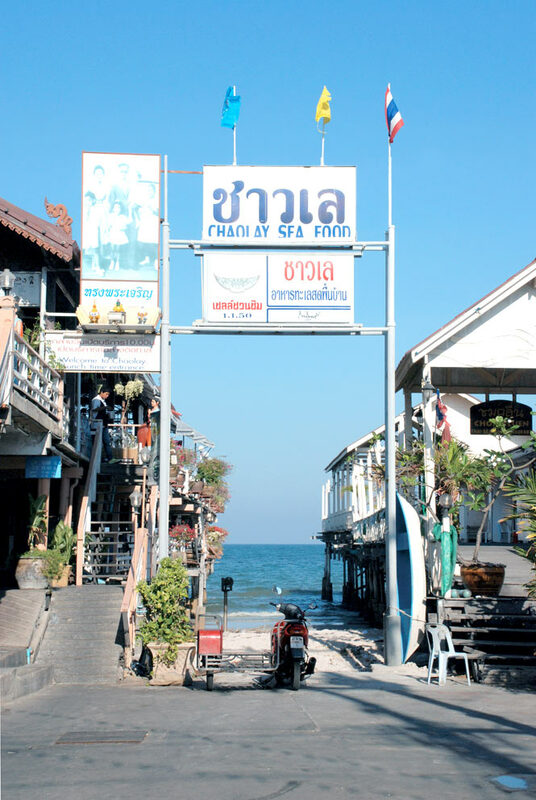 A seven-year-old institution, the Let’s Sea Hua Hin Beach Restaurant (83/188 Soi Talay 12, Khaotakieb–Hua Hin Rd. ; 66-32/536-888) now sits beside a 40-room resort. Locals and tourists alike descend for the homey café fare: muffins and smoothies for breakfast, and interesting salads—papaya with blue crab, banana blossoms with shrimp—for lunch and dinner. Of the numerous stilted seafood restaurants cluttering the wharf, Chaolay (15 Naresdamri Rd. ; 66-32/513-436) draws the largest crowds with its split-level dining room built into a pier. Pick your dinner from the fish tanks on the ground floor before retreating upstairs, where a small army of waiters will deliver your meal in a matter of minutes. Across the street, Mondo Vino (22/65 Naeb Kaehat Rd. ; 66-32/531-493) stocks a good range of wines from around the world, which can be enjoyed by the glass on a sunny terrace. Better still, take a bottle away to pair with cheeses from the Del Casaro (30/10 Hua Hin Rd. ; 66-32/522-749; delcasaro.com) cheese factory—try the smoked scamorza and low-fat Italico with herbs. Enjoy your tipple at the source with a visit to the Hua Hin Hills Vineyard (204 Moo 9, Baan Khork Chang Patana; 66-81/701-8874; huahinhillsvineyard.com). 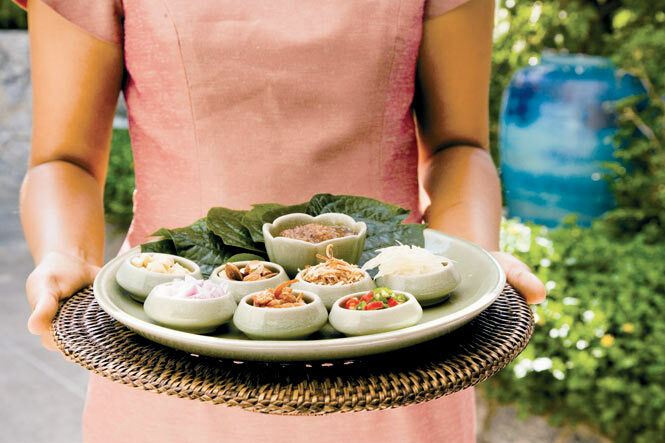 Housed in a wooden sala surrounded by vines, the restaurant uses local ingredients in deceivingly simple Thai and Western dishes. Antipasto platters make the perfect companion to a bottle of house Shiraz. A 2007 addition to the Hyatt Regency Hua Hin, The Barai (91 Hua Hin–Khao Takiap Rd. ; 66-32/511-234; thebarai.com) is a dramatic enclave of eight residential spa villas alongside 18 treatment rooms, a color confection with plum-and-maroon walls and stained-glass windows that cast rainbows over the beds. Outside visitors and hotel guests can enjoy spa rituals based on the four elements, with highlights like the green-tea-and-white-clay body wrap and sweet-basil-and-kaffir-lime compress massage. You don’t have to check into the Anantara Hua Hin (43/1 Phetkasem Beach Rd. 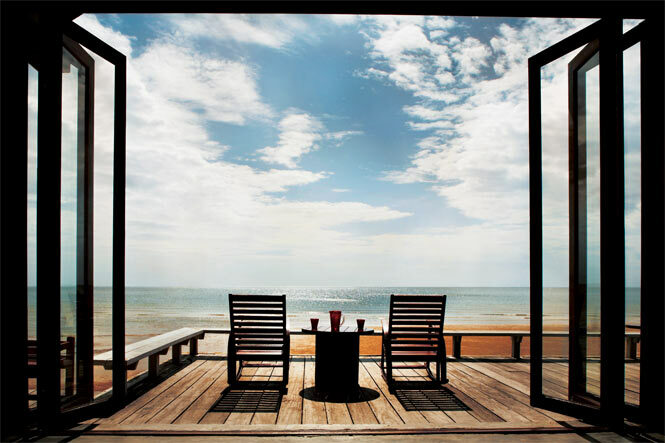 ; 66-32/520-250; huahin.anantara.com) to make the most of its spa, a secluded compound set amid landscaped gardens. Spa suites come with private courtyards, while the menu ranges from Thai herbal scrubs to dosha-balancing color-therapy steam baths. Talk to a local and they’ll tell you that you haven’t experienced Hua Hin until you’ve been to the Night Bazaar (Dechanuchit Rd.). Held daily from 6:30 p.m., the market is a great place to sample snacks—seafood kebabs, curries, Thai sweets—and there are dozens of stalls selling handicrafts and knick-knacks. For a taste of Hua Hin heritage, stop by the Antique Furniture Supply (6 Naresdamri Rd. ; 66-32/515-797), unmissable thanks to its sidewalk display of old tricycles and unicycles. Inside the rickety wooden shophouse you’ll find black-and-white photos of the area, old gramophones, furniture, and vintage clothing. At the other end of the spectrum, the AKA (Petchakasem Rd., 66-32/618-900) boutique sells ultra-modern designer homewares: the bamboo lamps and lacquerware are particularly attractive. Founded by Thai royalty, Khomapastr (218 Petchkasem Rd. ; 66-32/511-250; khomapastrfabrics.com) has been producing impeccable screen- and hand-printed fabrics for more than 60 years. The new Hua Hin boutique, opened in 2008 to mark the company’s anniversary, is filled with rolls of lemon-yellow and dusty-blue fabrics as well as ready-to-go satchels and clothing items.